Russia started the first day at an arms show in Malaysia with a preliminary agreement on the delivery of six Su-30MK2 fighters to Indonesia, the Kommersant business daily said on Wednesday. 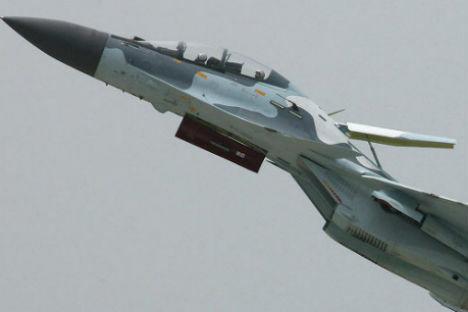 Kommersant cited a Russian source at the talks with Indonesia during the LIMA-2011 arms show on the main island of Langkawi as saying that a contract on the Su-30MK2 delivery could be signed as early as by the end of 2011. The source did not specify the price of the contract as it would depend on the array of weaponry to be installed on the aircraft according to Indonesian specifications. However, an anonymous source in the Indonesian delegation said the contract could be worth at least $500 million. Russia’s state-arms exporter Rosoboronexport refused to comment on the negotiations. Russia recently completed a $300-million contract signed in 2007 on the delivery of three Su-30MK2 and three Su-27SKM fighters to Jakarta in addition to two Su-27SK and two Su-30MK fighters purchased in 2003. Indonesian Defense Minister Purnomo Yusgiantoro said in October 2010 that his country needed a full-size squadron of 16 Su-family fighters. The Su-30MK2s are optimized as naval strike fighters. Jakarta became one of Russia's main arms buyers in 1999 when the United States tightened an embargo on arms sales to the country over alleged human rights violations.